It’s been said the way to people’s heart is through their stomachs, and some immigration activists were hoping that adage might work for them as they pressured lawmakers this week to back immigration overhaul proposals. Activists Thursday attempted to deliver half cakes to members of Congress in nine different states, while singing "Happy Birthday" in English and in Spanish. “We have worked with the congressional representatives of these states in a variety of ways throughout the spring and summer,” said Laura Barrett, campaign director of Gamaliel, a grass-roots network of faith-based organizations. “We are trying every which way we can to get lawmakers focused on fixing the broken system." Ana Garcia-Ashley, Gamaliel&apos;s executive director, still felt the group in Wisconsin made progress, even though it didn’t get to speak with Ryan. “We have a 20-minute meeting schedule in Kenosha with him next week,” she said. 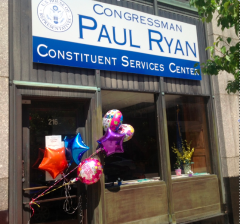 A spokesperson for Ryan&apos;s office said their office in Racine had commitments elsewhere in the district, and posted signage on the office door that the Racine Constituent Services Center would be closing earlier than usual. The spokesman said the staff received the balloons and their specific concerns on the office door early Friday morning. He also added that "staff in both D.C. and Wisconsin have met with members of Gamaliel a number of times in recent months to discuss immigration reform. We are aware of their concerns related to the immigration reform debate and appreciate their continued input." Missouri brought similar challenges and victories. The exchange didn&apos;t go as planned at Rep. Ann Wagner&apos;s office, but a spokesman for Wagner said it was because the group showed up unannounced and without an appointment. "At no point did we refuse to talk with them, and, yes, we have their cake. We told them that we would be happy to meet with them in the future if they made an appointment," Wagner&apos;s spokesman said. 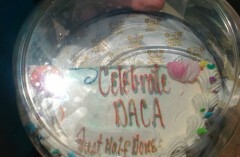 Rep. William Lacy Clay&apos;s staff took the cake and congratulated "DREAMers" that are pushing for an overhaul. "A delicious cake was delivered to Congressman Clay’s office in downtown St. Louis on Thursday afternoon, with words of thanks for his steadfast support for comprehensive and compassionate immigration reform," said Steven Engelhardt, Clay&apos;s communications director. In Pennsylvania, GOP Rep. Keith Rothfus&apos; staff accepted the confection and even spoke with activists. The group that visited GOP Rep. Tim Murphy&apos;s office should have brought the ice cream given the heated standoff that ensued. Sarah Regenspan, organizer with PA Interfaith Impact Network said, "Three police officers came in and asked us all to leave." Gamaliel and other immigration groups want Congress to pass the Senate version of an immigration overhaul bill, but they hope the final version has less expensive fees. They are also concerned about the length of time the process is projected to take. “We also want Congress to be clear,” Barrett said. “If they don&apos;t pass comprehensive reform this fall, immigrants and people of faith are going to be very disappointed with them."